Let’s cut to the chase with this. Lemon Meringue Pie is the best dessert in the world. I’ve been slowly building on my lemon meringue pies over the years and have accepted the fact that come birthday time, it’s a little meringue something that is to be made for the celebratory affair. As the day in question was going to be a day that fell in the middle of the week with rather a lot of ‘normal’ things going on around it, I took it upon myself to create my own party in a pie shell. As I’ve said before, I love, making my own birthday cake (or pie) as it happens. It means I get to make whatever I want and however I want. That is indeed a wonderful thing when I usually make things to cater for other people’s taste buds all year long. Lemon Meringue Pie Recipe can be found here. I’ll admit, there was a small evil mother moment pause in the kitchen that particular morning. It was brief, and the thought process went pretty much like this. Oh!… And there you have it. The rather large option of an entire tart to yourself because you put something in there (which is delicious and wonderful and makes your mouth sing) or…you could omit it because you are a considerate mother and probably shouldn’t be eating a whole family sized tart to yourself anyway. How about you? 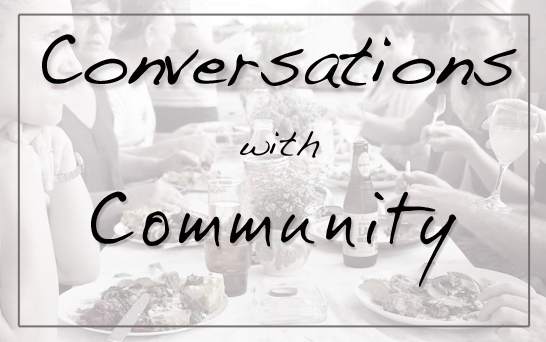 Do ever have these kitchen conversations with yourself? What would you have done? In a blender, pulse flour, sugar and butter until resembles bread crumbs. Tip out to a bowl and add vanilla, egg yolk and cold water. Knead lightly until it comes together to form a dough. Roll dough between two pieces of baking paper, to about .5cm and rest in the fridge for about half an hour. Shape into your greased tart tray. Bake blind at 180C for about 15 minutes. Mix all ingredients together in a bowl, except the raspberries and almond flakes. 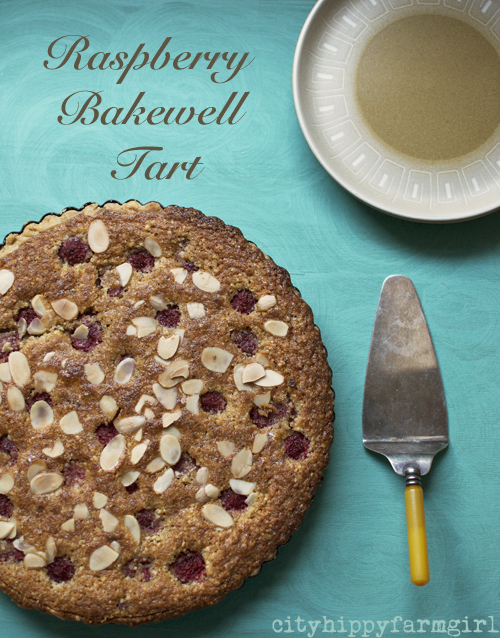 Gently fold through the raspberries and spoon mixture into pastry lined pie dish. 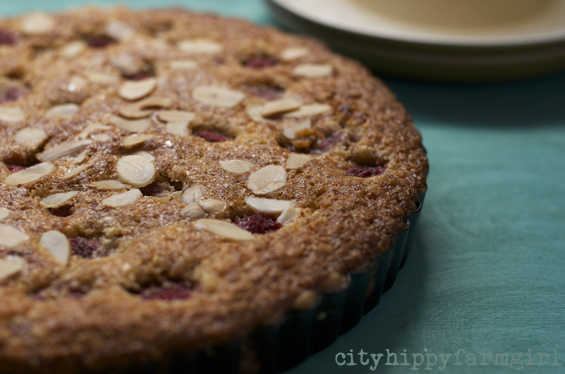 Scatter the almond flakes on top and bake for about 45 minutes at 180C or until golden. I’ve just celebrated another birthday rolling around. Time spent with lovely people, delicious food and lots of happy moments. I’ve also been thinking of another that is no longer here. Thinking of my grandfather who left me with a head full of happy memories, that I frequently bring out and go through. Flicking through those memories like a well worn scrap book, with mental scribbles, loved pictures and happy moments. Ours was a shared birthday. It was always such a special feeling knowing that our birthday was on the same day. Giving me a loving connection with the grandfather I adored. A man, who to me always smelt like smoked apple wood, and occasionally raw onions as he loved them on sandwiches. He had a sweet tooth for certain things, introducing me to sugar coated jubes that would get soft and squishy in the car. There were scoops of vanilla icecream with spoonfuls of his home made jam on top. He also knew answers to more trivia questions than I could ever hope to know in a lifetime. Answers would roll off his tongue like a well rehearsed dialogue. No pause for thought as the reply seemed so easily retrieved. Big boxes of locally grown apples would be brought by him when ever he came to visit, followed by bulging jars of loose change to be carefully counted and divided amongst the grandchildren. Counting was always my job, as I was the eldest. Every cent was divided up and then we could spend it in any way we wanted. We would go to visit and on his arriving home after a long day, we would hear the sounds of his footsteps coming up the stairs. The stairs always lasted forever as he continued stepping on the same few top stairs, making it sound like they were ten stories high. Building up the excitement, my siblings and I giggling with anticipation of him being so close. Long squashed hugs would follow, as we would all scramble for his attention. In his last year, while he was sick, I got to tell him that I had met the man I was going to marry. This comforts me in a funny kind of way. Even though he didn’t get to be at my wedding or get to know any of his great grandchildren, he at least got a glimpse of the path I was about to head down. A path, I think that would have made him incredibly happy. As long as I have these special memories and a hundred others, he will always be with me. Not mourned over for his loss, or the unfairness of a life taken away too soon but celebrating in the life that he did have. A life that I got to share a little part of, which I’m incredibly grateful for those years, and those birthdays we did get to share together. 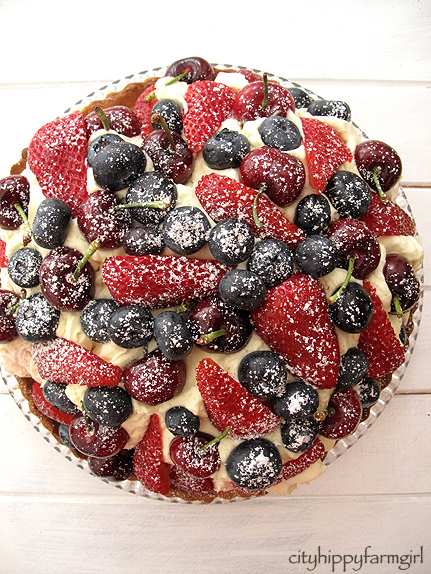 …and I also think he would have quite liked a slice of this birthday berry tart. Drawing from my last years ‘a rather tall birthday cake‘ and also inspired by a gorgeous recipe from Jamie Oliver’s ‘Jamie does…cookbook‘. This little number was the result. Pastry (recipe here) base can be cooked the day before. Pastry pricked all over and then baked blind for 20 minutes at 180C in a greased tart pan (the kind that pops out is good) and then a further 10 minutes uncovered. Pastry should be crisp and golden. Mascarpone vanilla bean cream. Whip 300mls cream to soft peaks, then add 1/2 cup icing sugar and one scraped vanilla bean pod. Add 250g mascarpone and gently whip again until mixed through. Berries- strawberries, blueberries and cherries. Smooth out several spoonfuls of the mascarpone mixture on to the base of the cooked pastry. This will help the meringue stick a little. 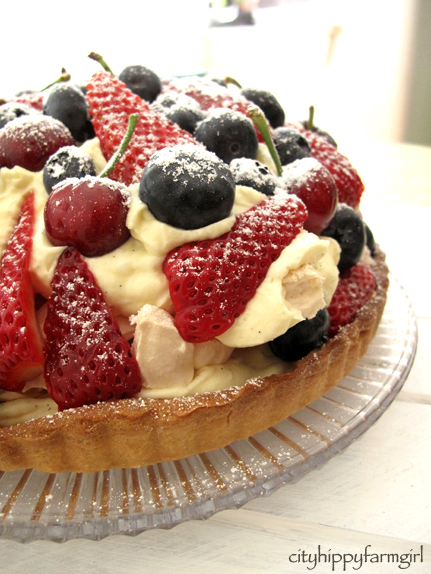 Break the meringue up and build a decent sized layer, Spoon the remainder of the mascarpone mixture all over, filling in any meringue holes and then cover with your favourite berries. Dust with a little icing sugar. 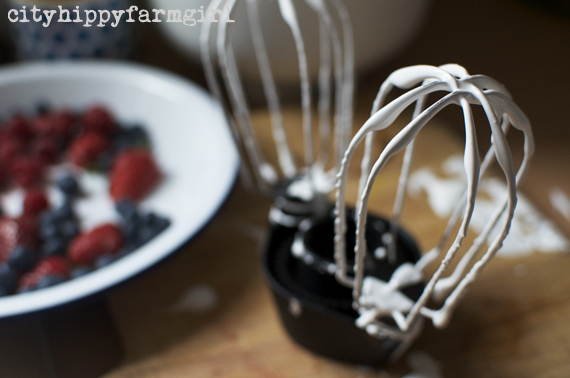 In a mixer beat egg whites until they are stiff and then slowly add sugar in small amounts. Mixture should become stiff, sugar disolved, with lovely peaks. On some parchment paper lay 3 disks of meringue. Large, medium and small. The smaller one with peaks and the other two, flattened. Now bake at 120C for approx 1hour 45 minutes. Allow to cool. In bowl add mascarpone, scrapped vanilla pod, rose water, sugar and whip. In a seperate bowl whip the cream up and then carefully fold through the mascarpone mixture. Time to get those layers happening. 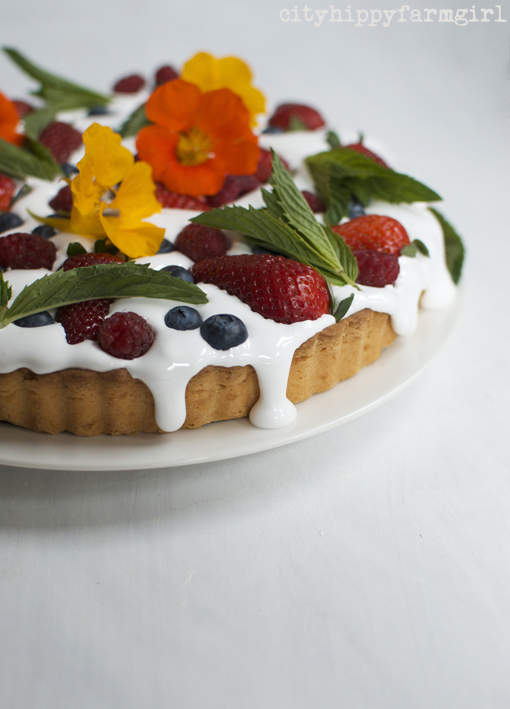 Meringue, mascarpone, berries, and then again. 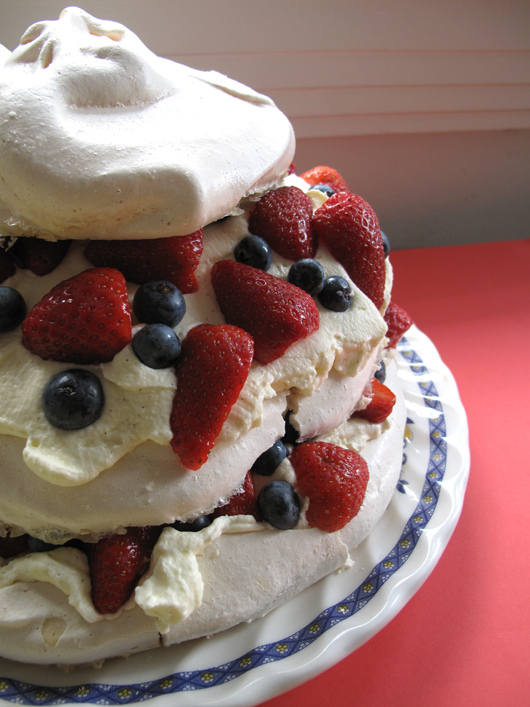 With the peaked meringue at the top. Verdict?…Actually pretty good. I still love the combination of mascarpone and vanilla, I’ve used it a few times now and I think there just may be a few more times to come. The meringue, I hadn’t made before, but it was actually pretty fun to make. I really like the fact that it is so light, and the berries were just a good addition. A contrasting fresh flavour with the sweetness of the other two. 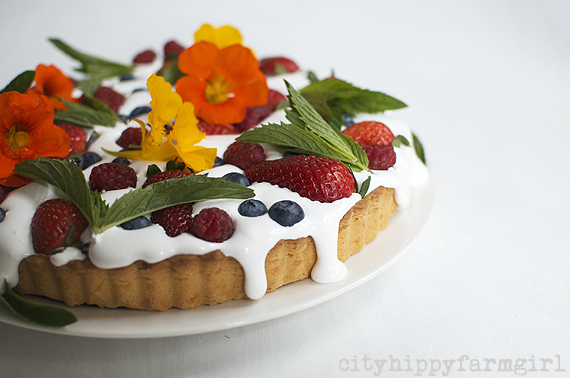 An easy cake that speaks of summer. So will I be making it again? Yes, I think I just might.